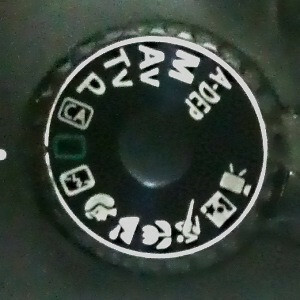 All DSLRs and a lot of smaller cameras have a mode dial on the top, the cameras that don’t have a physical dial always have a mode menu somewhere – in this post I’ll quickly cover all those modes, what they are for and when you should use them – I’ll also comment on what modes to use when learning photography. There are a lot of cameras out and they don’t all have the same modes (and they have different names for the same modes), so, if you see a mode on your camera that isn’t on the list just leave a comment and I’ll update the list – and if you see a mode on the list that isn’t on your camera that’s ok, not all camera’s support all modes. Full auto/ full auto with no flash – In this mode the camera does all the work, modern cameras are actually very good but they don’t know what you are photographing and they don’t know how you want the picture to come out – so the camera will try to make all the safe average boring choices and this is likely to result in a safe average boring photo. This is a good mode for “safety shots”, photos you take just to make sure you have something if the picture you planned to take doesn’t come out right. If you see a once in a lifetime event getting a few pictures on auto mode just to make sure you got it is a good idea – and while you’re learning taking an auto shot in additional to a non-auto shot is smart because you are likely to get some badly exposed photos until you learn to use your camera’s other modes. For learning I recommend using this mode only for safety shots, you are not learning anything while in this mode. Scene modes (portrait, landscape, etc. ), CA, A-DEP – Those are automatic modes where you tell the camera what you are photographing, those are likely to result in a better picture than full auto mode because the camera can make a more intelligent choice about what settings to use. Those are good modes for people who are not interested in photography and don’t want to learn about aperture, shutter speed and the likes. For learning I recommend not using those modes at all because, like full auto mode, you are not learning anything while using those modes. Program (P) mode – In this mode you can use all the camera’s option but not set the aperture and shutter speed directly. For learning I recommend using P mode for a little while to get a good feeling of selecting the correct ISO to and using the other camera’s features and then moving to A/Av or S/Tv modes. Aperture Priority (A or Av) mode – In this mode you set the aperture and let the camera choose the shutter speed, in this mode the camera does not make decision for you because for each aperture value you set there is just one possible shutter speed. This is a good mode for non-action shoots because it let you control the depth of field directly, with exposure compensation and exposure lock you can also override the camera’s light meter when the camera gets the exposure wrong – but you should consider switching to M mode if the camera gets the exposure wrong. Note that on Canon DSLRs in Av and Tv modes the flash is used as a fill flash only, so if you want to use fill flash just switch to Av or Tv mode, on the other hand if you want the flash to be the main light source you should use either M or P mode, on Nikon the flash is the main light source in P,A and S modes and to use fill flash you should use M mode. For learning this is a very good mode to use most of the time. Shutter Priority (S or Tv) mode – In this mode you set the shutter speed and let the camera chose the aperture value. This is a good mode for photographing moving objects because it let you easily choose a fast shutter speed to freeze motion or slow shutter speed to create some motion blur. Everything I wrote about aperture priority mode also applies to shutter priority mode. Manual (M) mode – This is a mode that let you set everything manually, it is very useful in a wide verity of situations (I’ll write about those in future posts) and is easier to use than people think. For learning getting comfortable with manual mode is extremely important. Bulb (B) mode – This is a mode where the shutter remains open for as long as you press the shutter, in cameras that don’t have a dedicated B mode you can usually use M mode and set the shutter speed to “bulb” to get the same results. Movie mode – Used for shooting video, obviously. Those are the camera modes, and as I said in the beginning, if you can’t find a mode your camera has on the list just leave a comment below.